The triumph of the Japanese becomes concrete on penalties, after an exciting game that saw the United States give the World to opponents. Japan World Champion 2011! His star, Homare Sawa, 33-year-old INAC Leonessa midfielder, wins the Adidas Golden Shoe as the winner of the top scorer with five goals in front of Wanbach and Marta with four and is awarded the Golden Ball, as best player of the World tournament. Japan in awe for this well deserved victory and Americans disappointed for having thrown the third world title to the wind. The United States played this final best, they immediately attacked, aware of having their best weapon in their athletic performances, and they put in difficulty the girls of the Rising Sun who resisted and managed to counter their opponents. The first half ends in scoreless with the Americans recriminating numerous missed net actions, two piles and no doubt they deserved something more. The SVEzia climbs on the lowest step of the World podium and wins the Bronze medal. A result that on the eve would have made the happiness of the Swedish Gialloblu but on balance is only the medal of disappointment. Sweden - France was a bad game with three wonderful goals that have revived the interest of athletes. Large number of Marie Hammarstrom at the 82 ° which gives the victory to Sweden. The game starts sly with the two teams that are studying waiting for the first move in search of victory. For the Swedes it is the game of disappointment and seem the least encouraged to conduct the dances while the "blues" look for a bronze that could crown the game, expressed in this World Cup, beautiful but inconclusive. Read more: SWEDEN CONQUERS THE BRONZE! GREAT JAPAN! THE SUPERBY OF DENNERBY DEFITS SWEDEN! Great Japan, congratulations! The Japanese repeat the excellent performance that has defeated the great Germany and sink Sweden. The merit of expressing a good choral game, exchanges and enviable ball possession is to be recognized to Japan. Tactically humble and alert, the women of the rising sun, took to the field knowing their merits and the limits of the most ambitious opponents, striking at the strategic points that have allowed him to conquer the final. Read all: GREAT JAPAN! THE SUPERBY OF DENNERBY DEFITS SWEDEN! FRANCE PLAYS WELL, THE AMERICAN WIN! France dominates the match on the level of the game but the many actions are not exploited on the net. The Americans are more incisive, cynical and do not miss the opportunity to shake the French network. This is, according to my point of view, the movie of the match. The US started strong and put the French team in difficulty. The advantage is the result of a choral action that leads Heather O 'Reilly to break on the left and cross a delightful cross on the foot of twenty-four striker Lauren Cheney who infiltrates the rear guard. France forced to attack to look for a draw and Americans ready to hit in speed. This was a usual copy of the previous game, which allowed us to see the game potential of the Number One only in flashes. Read more: FRANCE PLAYS WELL, THE AMERICAN WIN! In the end the strongest and most deserving team triumphed ... but what a fear for the States! 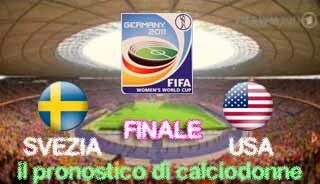 Brazil - USA was considered the big match of these semi-finals and instead, in my opinion, has largely betrayed the expectations. Perhaps, that unfortunate Daiane goal, after just two minutes from the start of the game, gave the momentary advantage to the States and immediately changed the tactics of both teams, leading the Americans to wait for the Brazilian reaction to hit on the break or maybe who knows .. like every great game that respects to lose out was the good game. The fact is that the advantage given by Brazil has not been exploited by the US and the game has taken bland rhythms facilitating the tasks to both teams. First time that ends in boredom, with a Brazil without ideas or imagination and the Americans momentarily satisfied by the advantage. SWEDEN, BETWEEN DREAM AND REALITY THERE IS JAPAN! Sweden, as predicted, beats Australia and accesses the semi-final with Japan. The Swedes against the young Australia were strong and already in the first minutes of play went ahead with Therese Sjögran (11 °). The action of the Yellow is determined to close the game, Australia suffers the supremacy and the second goal that reaches the 16 ° with the star of Gothenburg Lisa Dahlkvist. Strong with the double advantage and sure to have the game in hand the girls of Thomas Dennerby are left to a moment of relaxation that finds in Australia the right time for their timid reaction, at the beginning, but dangerous with the passing of the minutes that allow to the oceanics to take self-confidence and be less fearful of the strong Swedes. Read more: SWEDEN, BETWEEN THE DREAM AND THE REALITY 'THERE IS THE JAPAN! JAPAN SHOWS THE GREAT GERMANY! The first real surprise comes with the victory of Japan over the favored Germany. The Japanese take the lead in extra time (108 °) with Karina Maruyama, JEF United striker Ichihara Ladies, trimming the first defeat to Germany, after sixteen useful results and unbeaten by the US 1999 World Cup and celebrate their first qualification in a semi-final of a World Championship. The Ladies of the Rising Sun have played a great game, opposing the Germans in terms of the game and the individual technique, thus compensating for a better athletic performance of the Germans. We have seen the Japanese prevail often, in midfield, in the one against one and synfoned synchronized game exchanges that have disoriented the noble opponents. Read more: JAPAN LAYS THE GREAT GERMANY! France beat England for 4-3 on penalties and qualify for the semi-finals. The British return to the island without having suffered a defeat and the awareness that there is so much to review and improve in view of the upcoming Olympics. The final result of 1-1, at the end of regular and supplementary times, should not be misleading because the game was mainly managed by the Blues, after the good English start and the advantage obtained at 59 ° with a goal from the midfielder Everton Jill Scott. After the first phase of the World Cup, the team has to face the quarter finals, with the surprise of the qualification of Japan and the confirmation of Australia that for the second consecutive time qualifies for the quarterfinals of the World Championship. The 9 July we could attend 20: 45 in Germany - Japan and 18: 00 in England - France. The 10 July will clash at 13: 00 Sweden - Australia and at 17: 30 Brazil - Usa.Out from the games Norway that was presented in Germany with good intentions and instead leaves, playing good games, from the World Cup and loses opportunity to qualify for the next Olympics. 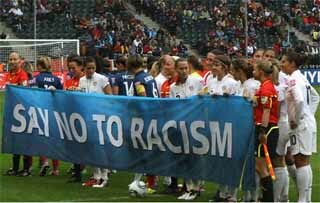 The Nordics were aware of playing against the Australians, present and future and they came out with the moral pieces. Two cases of doping, burst, like lightning from the blue, in the women's football championship. 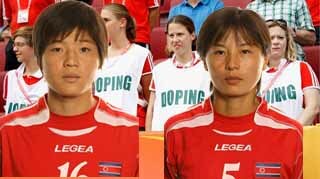 To open this ugly page of this wonderful World and women's football are Song Jong Sun and Jong Pok Sim, two North Korea players, turned out positive to the steroids. In sports, anabolic steroids are used to increase muscle mass and potency. Two cases, which will also discuss the moral good faith of the North Korean National, already eliminated from this World Championship on the field and called the entire team of North Korea to undergo an anti-doping test after yesterday's match between North Korea and Colombia. The regulation in these cases is clear: "When more than one member of a team has tested positive for the anti-doping test, the body responsible for the competition will carry out appropriate examinations of the whole team". We just have to wait for the results of the analysis and hope that this insane case remains isolated.